ANCHORAGE, Alaska (AP) — An estimated 10,000 walrus unable to find sea ice over shallow Arctic Ocean water have come ashore on Alaska's northwest coast. Scientists with the National Oceanic and Atmospheric Administration on Friday photographed walrus packed onto a beach on a barrier island near Point Lay, an Inupiat Eskimo village 300 miles southwest of Barrow and 700 miles northwest of Anchorage. The walrus have been coming to shore since mid-September. The large herd was spotted during NOAA's annual arctic marine mammal aerial survey, an effort conducted with the Bureau of Ocean Energy Management, the agency that conducts offshore lease sales. An estimated 2,000 to 4,000 walrus were photographed at the site Sept. 12. The U.S. 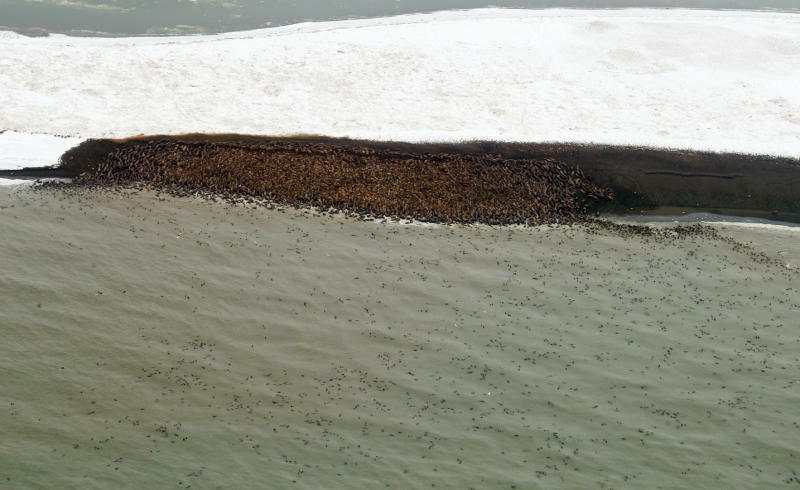 Fish and Wildlife Service, the agency that manages walrus, immediately took steps to prevent a stampede among the animals packed shoulder to shoulder on the rocky coastline. The agency works with villages to keep people and airplanes a safe distance from herds. Young animals are especially vulnerable to stampedes triggered by a polar bear, a human hunter or a low-flying airplane. The carcasses of more than 130 mostly young walruses were counted after a stampede in September 2009 at Alaska's Icy Cape. Remnant ice kept walrus offshore in 2008 and again last year. The goal of the marine mammals survey is to record the abundance of bowhead, gray, minke, fin and beluga whales plus other marine mammals in areas of potential oil and natural gas development, said NOAA Fisheries marine mammal scientist Megan Ferguson in an announcement. "In addition to photographing the walrus haulout area, NOAA scientists documented more bowhead whales, including calves and feeding adults in the Beaufort Sea this summer compared to 2012," said Ferguson. "We are also seeing more gray whale calves in the Chukchi Sea than we have in recent years." Environmental groups say the loss of sea ice due to climate warming is harming marine mammals and oil and gas development would add to their stress.